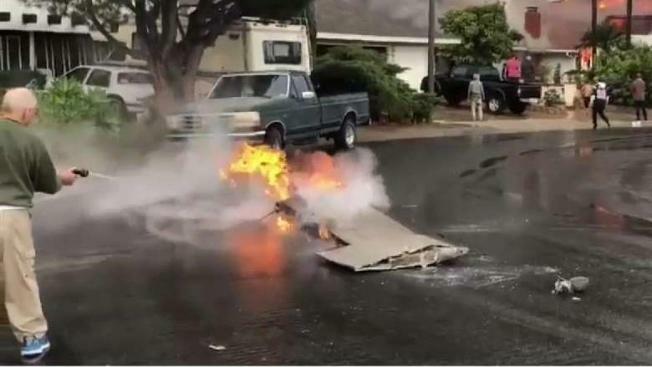 Flaming wreckage appears in the street after a Feb. 3, 2019 plane crash in Yorba Linda. 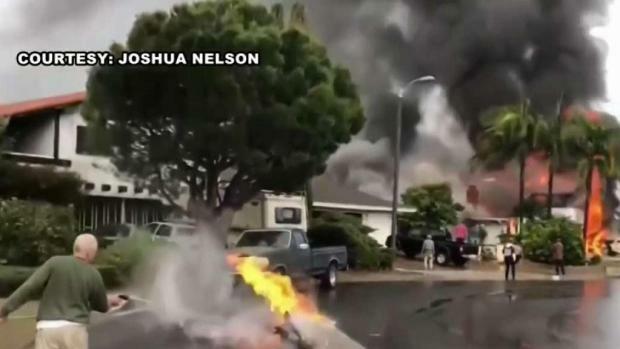 A preliminary federal report says the pilot whose plane broke up and crashed into a Southern California home was warned before takeoff that he was heading into bad weather. The NTSB says Fullerton Municipal Airport officials informed pilots that developing rain required the switch from navigation by sight to navigation by instruments. One neighor shared fond membories of the couple onto whose house crashed wreckage of the light plane that disintegrated as it fell from the sky Sunday in Yorba Linda. Of the six family members inside, only two survived. Authorities have yet to make positive identification of the deceased. Patrick Healy reports for the NBC4 News on Tuesday, Feb. 5, 2019. The report doesn't say if Pastini went to instrument navigation. The crash happened just minutes after takeoff. The plane climbed to about 7,800 feet before its rapid descent through heavy clouds. Witnesses reported seeing the plane come out of the clouds before parts began breaking off. One witness said the plane appeared to have a downward pitch of about 60 degrees before a high-speed dive recovery. Near the bottom of the recovery, the plane rolled to its right and the left horizontal stabilizer detached, according to witness reports. The left wing then sheared off. Flames appeared to shoot form the plane and witnesses reported an explosion and plume of black smoke.